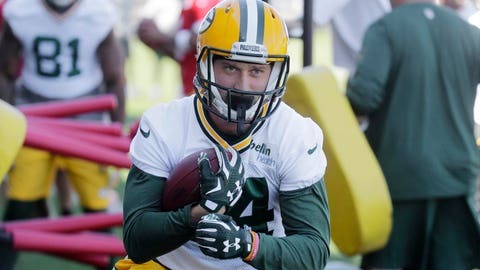 Jared Abbrederis runs a drill during Packers training camp in June 2015. Former Badgers wide receiver Jared Abbrederis has been signed to the Green Bay Packers active roster from the practice squad. The Packers also released defensive tackle Bruce Gaston. Abbrederis was drafted by the Packers in the fifth round of the 2014 NFL Draft. Abbrederis suffered a knee injury in training camp in 2014 and spent his entire rookie season on injured reserve. The Wautoma, Wis., native was named first-team All-Big Ten twice while at Wisconsin and finished his career tied for the school record for receptions (202) and ranked second all-time in receiving yards (3,140) and touchdown receptions (23). Abbrederis will wear No. 84 for Green Bay. Note: In addition to the two roster moves Saturday, the Packers downgraded wide receiver Davante Adams (ankle) and safety Morgan Burnett (calf) to doubtful for Sunday’s game against the 49ers.